Tangents, what they are and why artists care about them. Tangents – what are they and so what? Purpose. My intention in writing this article is to explore and perhaps shed some light on how the word “tangent(s)” is used in drawing, illustrating, painting and photography. I would like to share with you how this topic came up in conversation. Then, I’ll talk about the definition of tangent as it applies to artwork. 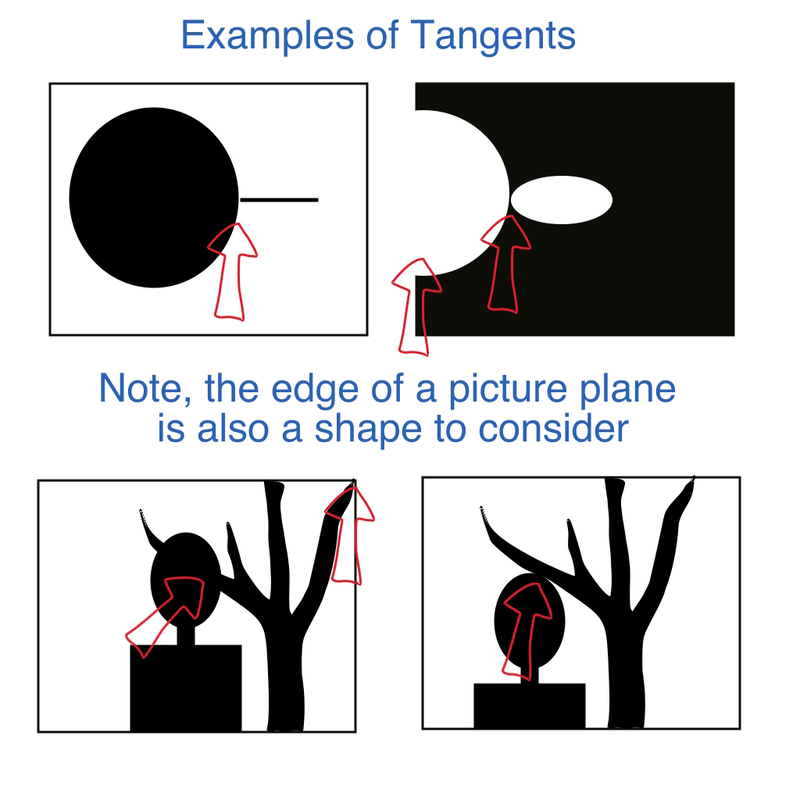 To illustrate the issue, I will include some examples of tangents in my own work and suggest some possible remedies. Finally, I will list some references and links for further study. Summary. Tangents come into play when designing two dimensional artwork such as drawings and paintings. They are created when two objects, such as a line or shape, touch but do not overlap. Because they can be visually awkward or ambiguous, tangents tend to draw the viewers attention. By learning how to identify tangents, the artist can either avoid them altogether, or use them to advantage. Tangents As A Topic Of Conversation. Banquet Discussion. 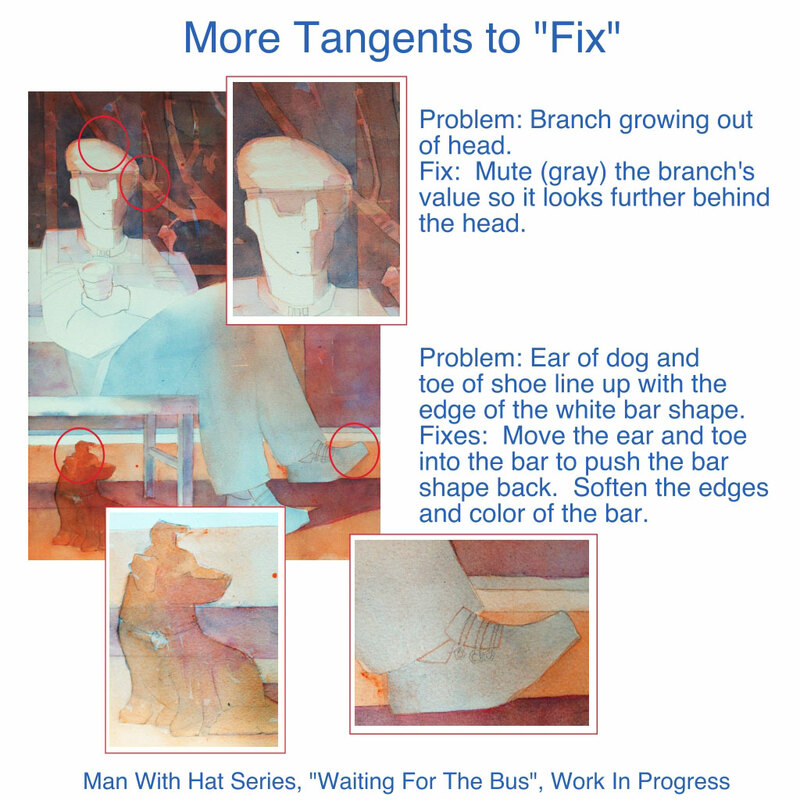 The topic of “tangents” came up over dinner while I was attending the Watercolor Society of Oregon’s Spring Convention. I can’t remember who brought up the topic but the gist of the story was that a fellow artist missed out on the top prize of a juried competition because of a tangent in her painting. What? My little brain cells clicked into alert mode. But, what if the tangent was supposed to be there? And, what is a tangent? I Know or I Think I Know. I thought I knew what a tangent was and so did my table mate. However, she described a tangent that wasn’t anything like what I thought a tangent was. Could there be more than one tangent, perhaps two tangents, at least? We discussed the problem for a while and, failing to resolve the issue, went on to discuss other matters. Gray Matter Spinning. Well, you might imagine my little brain cells would not let the matter rest. What was the definition and who was right? Did I know what I was talking about? Ignorance Is Not Bliss. In a way, no; I did not have a clear idea of what I was talking about when it came to tangents. Too many vagaries, from not being able to see the painting, to not knowing the definition of tangent as it applies to art. Time for researching definitions and looking for examples. In geometry, a tangent is a line that touches a curved surface but does not intersect it. Lets put this another way: tangents are two things, (lines or shapes) that are touching but not overlapping. They are pretty much the same in artwork as they are in geometry. Why Do We Care? When it comes to looking at realistic images, we seem to like a visual order to things. And, in the case of tangents, we like to know which shape or line is in front and which one is in back. We like our spatial arrangement to be established and recognizable. When the spatial arrangement is not clear, we have visual ambiguity; space collapses and the image looks flat. The Fix? Creating space by either shifting the line or shape or “pushing back” one of the elements by using aerial perspective (softening edges, muting tone, or moving color toward blue). I will elaborate about spatial relationships and fixes below. Note, the bottom two examples are supposed to be of a simplified shape of a person (head, neck shoulders) and a shape of a tree. Just to clarify; thanks! A Bit More Discussion And Elaboration. Issue For Realism. As I understand it, where this “touching but not overlapping” becomes a problem is in composing representational two dimensional art pieces. That is to say, if I want to paint a realistic picture, tangents are something to be aware of and concerned about. Because, you see, the tangents imply that the two shapes or lines are on the same plane. Space! Put another way, its all about spatial relationships. The issue with two dimensional works of art is that we are trying to depict a three dimensional world on the picture plane. If the two objects are on the same plane in life, then the tangent may not be an issue. But, what if they’re not on the same plane; what if one apple is deeper in shape than the other? If they’re touching, but not overlapping, it creates an ambiguity. The illusion of three dimensional space collapses and the image looks flat (as mentioned earlier). Creative Intent. So, what if I like to collapse the illusion of three dimensional space? Well, then, that’s me and part of creative intent. And, when I create then collapse space, the result is not particularly realistic; its expressive, stylized or stylized. A Word Of Caution. I would suggest being clear in your design that your intention is something other than traditional realism. Why? We are still concerned with communicating to our viewer and we want to invite the viewer into our world; include them in on the joke, so to speak. And, back to tangents, they can confuse your viewer. Back From My Tangent! Sometimes writing about issues we face while drawing or painting feels like waving in the air; its hard to articulate and communicate what I mean. Naturally, this is where examples come in handy! Example One: Man With Hat. It didn’t take me long to find some examples. I just had to look at my “works in progress” and recent painting. So, lets take a look at some examples from my “Man with the Hat” Series. Yes, I have some “tangent” issues. Consider my first example. I had an idea to add a tree behind my “Man with the Hat”, insert a few leaves and title it “Last Leaves of Autumn”. Seriously, it was my intention to have one leaf practically touch the face of my gentleman with a hat. Oh, just to explain, I composed this design BEFORE the WSO convention, the discussion and research on tangents. Still, I noticed something was awkward. When I transferred the design to the painting, I added some space between the leaf and the shape. Sidebar: Watch Adding New Things At The End! Trouble! Which brings me to my next insight. I get into trouble when I add things to compositions AFTER being finished. Its an “upsetting the apple cart” type situation. When something new is added to a picture, its like adding a new subject at the end of the story; its jarring. Then, you have to start “fixing” the composition. It might have been better to start a new drawing altogether. Multiple Tangents! And, that’s why this next variation on the “Man With The Hat” has at least three tangents that have to be dealt with. This is a “work in progress”, so I have room yet to adjust before I complete the painting. Tangent Example Two: Man With Hat and Dog. Here goes example two. First I decided to extend the tree branches behind the man. Second, I had an idea to add a dog. I’d seen a man with a dog at a bus stop and was inspired. Nice ideas, but the composition was already fairly well developed so now I have tangent problems to fix. Isn’t composing fun? Its all about problem solving! I found some interesting sites on the web that have more articles on tangents. Cartoonists who rely on line work have a particular problem with tangents. Empty Easel: Avoiding Tangents: 9 Visual Blunders Every Artist Should Watch Out For. Schweizer Comics: The Schweizer Guide To Spotting Tangents. Monkey Lunch: Tangent Slide Show. Control Paint.com: Avoid Visual Tangents, (video). Remember back near the beginning of this article and the dinner conversation I talked about? Well, my friend and I were both correct. Tangents crop up in pictures in many different ways. However, once you understand what they are, you can identify them and use them to serve your own pictorial purposes. Isn’t that wonderful? I hope you have enjoyed this article on tangents as they apply to two dimensional artworks. My intention was to shed some light on the subject, provide some useful information and share examples. If you were like me and were not certain about the usage of tangents, now you know a bit more! Please enjoy the next wonderful piece of art you come by, and, maybe, see if you can find a tangent or not!